The Society, along with many other local individuals and groups, objected to the licensing application for the Field Day event (1-3 June 2018). However, Lambeth allowed the application. There seemed to be little, if any, clear benefit to the general community of Herne Hill in the proposal. Loss of the amenity of large areas of the park for extended periods during the summer (weeks rather than days) was a major factor, in addition to the large crowds and noise nuisance of a three-day event. The promised open meeting with councillors, officers and event organisers to review last summer’s events in Brockwell has been down-graded to a drop-in feedback session. The original proposal was for it to be an open meeting, similar to the one held at Baptist Church before the event. The idea was not only for locals to give feedback but have an opportunity to ask questions of the Council about how specific issues are being addressed. This plan has now been scrapped in favour of a ‘drop in’ at Gallery 198. It isn’t clear whether senior officers, cabinet members or councillors plan to attend. The dates are the afternoon of 16 and evening of 17 October. Brockwell Streets has launched a crowdfunded judicial review of Lambeth’s events policy for its parks. Lambeth want to have eight major events in Brockwell Park every summer. If you’re on Facebook, you might consider joining the Brockwell Tranquillity campaign group. You can read our letter of objection here. 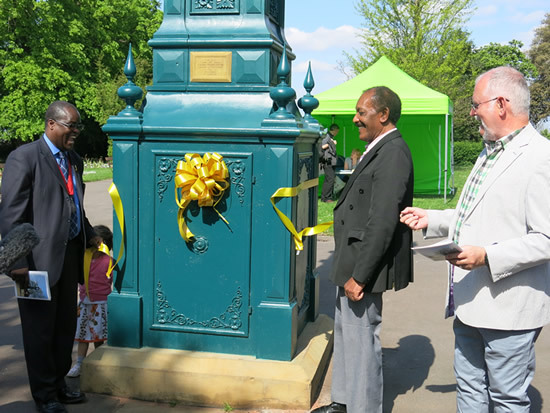 A fundraising campaign started by former Lambeth Mayor Rudy Daley and the Friends of Brockwell Park raised over £20,000 to restore the neglected Tritton Clock in Brockwell Park to its former state. It was given to the public by the MP for Norwood, Charles Ernest Tritton in 1897 to mark Queen Victoria’s Diamond Jubilee, but for a long time was in a poor condition and not working. 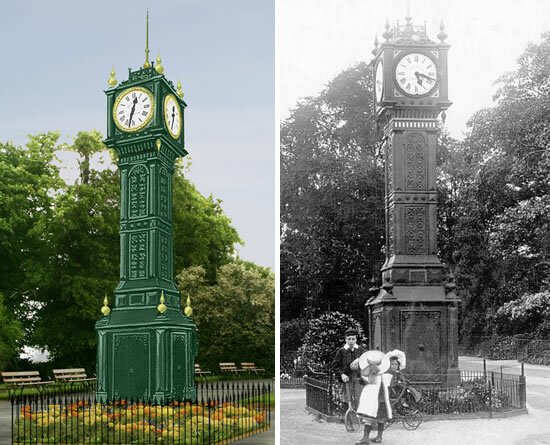 Following conservation work by the original manufacturers of the clock, Gillett and Johnston, it is now working again, fully restored and decorated in green and gold, as described in the South London Press on 3 July 1897. The restoration has preserved the original mechanism of the clock, which needs to be wound by hand every few days. The restoration was celebrated on 3 May 2014. On the left is Deputy Mayor of Lambeth Adedamola Aminu, in the middle is Rudy Daley (first donor) and on the right is Peter Bradley (Chair FOBP and of the Clock-tower Project Group). Three local organisations, the Friends of Brockwell Park, the Herne Hill Society and the Brockwell Park Community Partners took on the project, with support from Lambeth Council. A huge thank-you to all who so generously contributed to the Project. 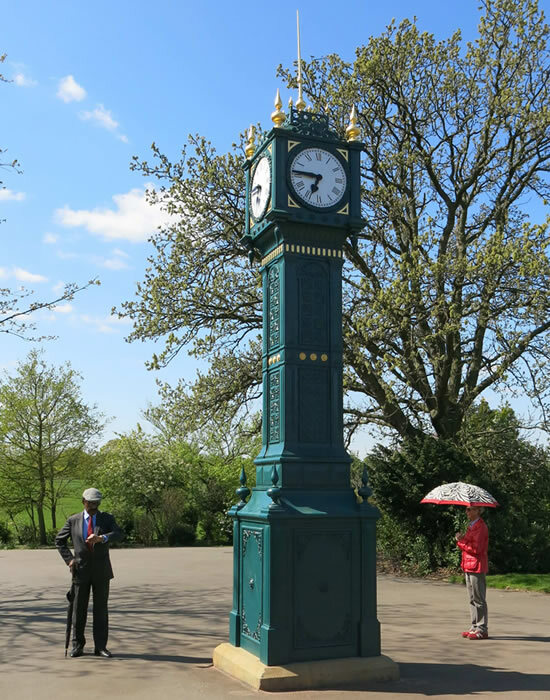 The clock and its tower next to Brockwell Hall were presented by the second MP for Norwood, Charles Ernest Tritton, in 1897 to commemorate Queen Victoria’s Diamond Jubilee. The clock kept time in the Park for nearly 100 years but had not worked for two decades. In design it is similar to the ‘Little Ben’ near Victoria Station. The clock tower was listed Grade II in 1981. It is a smaller version of that which stands in front of Victoria Station. Wendy and I would like to help by making a donation towards the cost of the restoration of the clock. Could someone contact us please? Wow - nearly £16,000 raised so far for this fantastic project. I have donated and look forward to seeing it working again very soon. I was in the Park yesterday , thinking how beautiful it was looking after all the thoughtful, high-quality restoration work. This will put the icing on the cake. I’ve donated, and I am delighted to be part of it. How wonderful the restored clock looks. I was born and brought up in Hurst street and Brockwell Park was my substitute garden,the fun I had there.I well remember the clock and I am so pleased that all of Brockwell Park is being so well cared for. As I live so far away now I hope to come back one day and have a wander in the park again. My cousin Paul Tritton and I are distant relations of Charles Ernest and we visited the clock tower yesterday It looks magnificent.